Operation Christmas Child is a project of Samaritan's Purse. We honor Jesus, the Christmas Child, by reaching out to children around the world. He said, "Go therefore and make disciples of all nations." (Matthew 28:19) How do we do this? We pack simple gifts into shoe boxes and pray for each box to bring God's message to hurting children living in terrible conditions around the world. 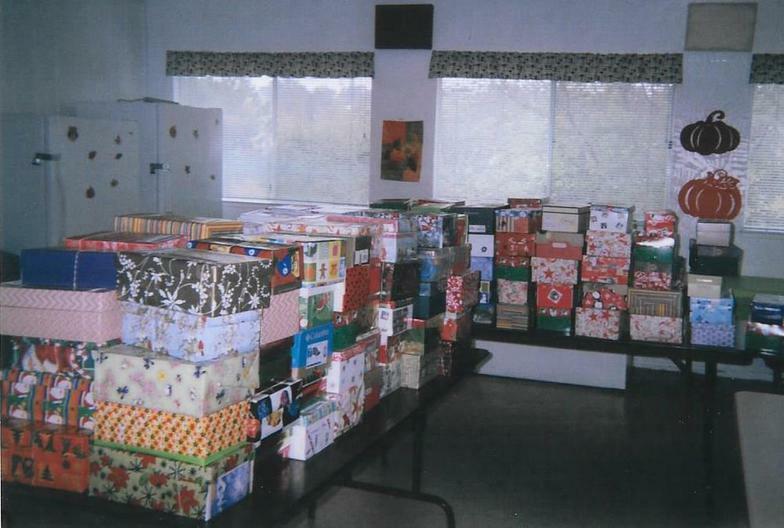 These shoe boxes are collected in November, then shipped to destinations overseas where people are living in refugee camps, natural disasters, extreme poverty, orphanages. Our boxes leave California by ocean liner, then travel over land by many modes of transport: canoe, camel, bicycle, donkey, or dogsled across mountain, desert, swamp, river, tundra or more. After the excitement of the shoe box gift, each child is invited to a discipleship program to learn the Word of God, and learn to read their own Bible in their own language.